Did you catch nutty Ben Carson’s speech last night, placing Hillary Clinton in a direct line from Saul Alinsky to Lucifer? Yes, that Lucifer, aka Her Lord Satan, known as the beast! Or crazy Chris Christie, apparently channeling Turkish President Recep Tayyip Erdoğan in criminalizing his political opponents, leading the RNC delegates in chants of “guilty!” and “lock her up!” But accusing charismatic women who seek political office of criminal or even demonic influence is nothing new in American history, as Lauren MacIvor Thompson argues in her fabulous mini-biography of Victoria Woodhull, the first woman to run for president–in 1872! The first election in U.S. history was, of course, in 1788, but it would be over eight decades before a woman could plausibly gather enough public recognition to actually make a real run at the Presidency. This “first in history” belongs to none other than Victoria Claflin Woodhull Martin (1838-1927). If you think Hillary is a controversial figure, trust me, she’s got nothing on Woodhull, who was first and foremost a newspaper editor, public speaker, and women’s rights reformer, but also a Spiritualist with three husbands, two children (one of whom was disabled), and a proponent of Free Love and Socialism. Despite her lack of formal education, she became one of the Gilded Age’s most forceful influences on social reform and women’s rights. It’s also true that her cunning and drive to succeed often resulted in a whole lot of lying, seduction, and outright charlatanism. Regularly called a harlot and “Mrs. 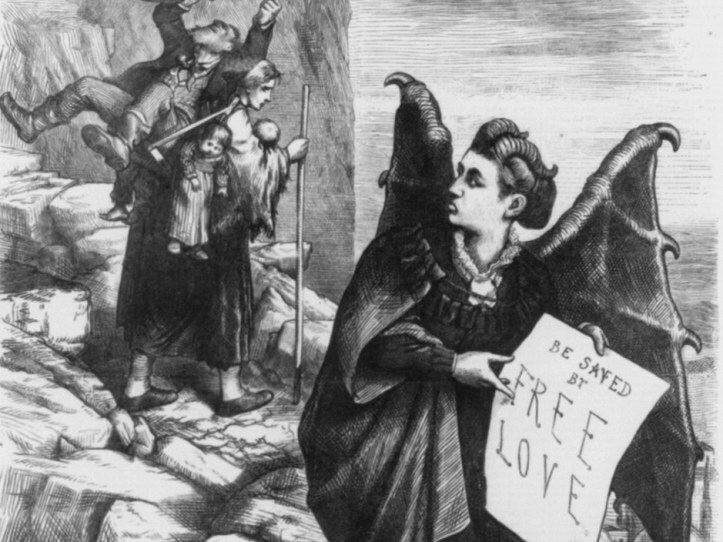 Satan” on the daily by her opponents, she also earned the wrath of her fellow suffragists who thought she was a detriment to their respectable cause. In fact, Susan B. Anthony hated Woodhull so much, she literally turned out the lights on her as Woodhull tried to address a meeting of the National Woman Suffrage Association. So take heart, Hillary. Before you, Victoria Woodhull was labeled as the original bitchy, lying, cheating, manhating, one-percenter running for President! In other words, history tells us there’s nothing new under the sun when it comes to women in the public eye. ← Historians on Trump: In which I talk all about menstrual blood, breast milk, and pee for an international audience. SO much of political rhetoric involving women (and immigrants and…) harkens back to the 19th century these days. Back when I was in grad school I thought all that history was quaint and we’d moved past that finally. But no… That was just a combination of my naivete and deliberate political movement by the so-called republican thought leaders who coordinate state and local change nationally. It’s crazy seeing modern-day politicians using the same arguments as Horatio Storer. Everything old is new again. We’ve all been there–the youthful optimism in school usually falls away once we enter the workforce and see men treated and paid very differently for the same work. For those of you who don’t know who Horatio Storer is, click here. It is indeed weird to have pols (and the Supreme Court!) entertaining the idea that contraception is a matter of public rather than personal morality. Whatever the successes of some of the revanchism, we’re not going back. I’m talking about specific archaic talking points that seemed even less socially-acceptable in the modern post-1930s/1980s era than going back to the gold standard. In the 20th century, arguments keeping women back evolved into different arguments about keeping women back, but there has been a recent resurgence back to the Victorian era’s arguments. Thank you Ann, for featuring Nursing Clio today in your post and our first “Run Like a Girl” essay! So glad to have your perspective and voice to help contextualize this craziness! Be sure to send me links to the series as it grows! That’s really eye-opening about the treatment of Woodhull. Yeah, there’s definitely a “kill the witch!” aspect to the Hillary-hate, which has now reached insane (if not historically unprecedented) proportions. But I want to take issue (at least a little bit) with your characterization of “crazy Chris Christie,” h-ann. What I find truly appalling about Christie’s despicable (and rhetorically unhinged) performance is that I’m pretty sure he’s NOT crazy, and I’m fairly confident that he knows better. The dude is a former US Attorney, after all. Unlike Ben Carson, who probably genuinely believes that Lucifer is in our midst and that Hillary Clinton is the Dark Lord’s evil emissary, Chris Christie, I suspect, doesn’t actually believe a word that he is saying. In his misguided ambition, he is deliberately speaking untruth to power. Which is actually morally WORSE than being a genuine political lunatic, I think. Anyway, Christie is completely finished if (I want to say “when,” but a superstitious dread demands “if”) Trump loses the general. As they say in the Autism community: behavior is communication! Crazy is as crazy does. When a former **US Attorney** leads chants to declare the political opposition “guilty” and to “lock her up,” then he might as well move to Turkey or North Korea or someplace where he’ll be more comfortable. I agree with you in that he is behaving exactly as he has decided to; it’s not unthinking. But it’s still totally crazy! Trumpworld rules are causing people to lose their minds. Never have I been so grateful to have spent a week in a house with no tv or internet access. I could read stories about Cleveland, but not watch… perfect. It strikes me that the more women are successful, the more extreme the rhetoric about keeping them in their place becomes. Desperation. . .